I've been told by Cinabar that this month is "Dry January" for some. Don't worry, you may have noticed this hasn't affected my usual boozy Saturday blogs, but I thought I'd write about this non-alcoholic sparkling wine called 'The Bees Knees' to help those that are looking for the taste of wine, but without the dizziness that can come with it. I'm not much of a white wine drinker per se, but I have the odd glass with a white meat roast now and then. The Bees Knees is produced by North South Wines and bottled in Germany, using non-alcoholic fermented grape juice and infused with green tea. It's marketed with floral aromas and a refreshing acidity. It is lower in sugar at about half the calories of a regular bubbly white wine. It is gluten free and vegan friendly. It sounds a bit too good to be true if you like your white wine sparkling. The trouble is, I don't… However, I'm always willing to try something different in some strange hope that the alcohol in sparkling white wine ruins the taste for me somehow and not the fizz itself! After being nicely chilled in the fridge for a good long while, the 200ml bottle gave a dangerous fizz as I popped the lid. So much so that I lost a little of the liquid inside before I could shove the open bottle in my mouth, as I didn't have an empty glass close by enough. 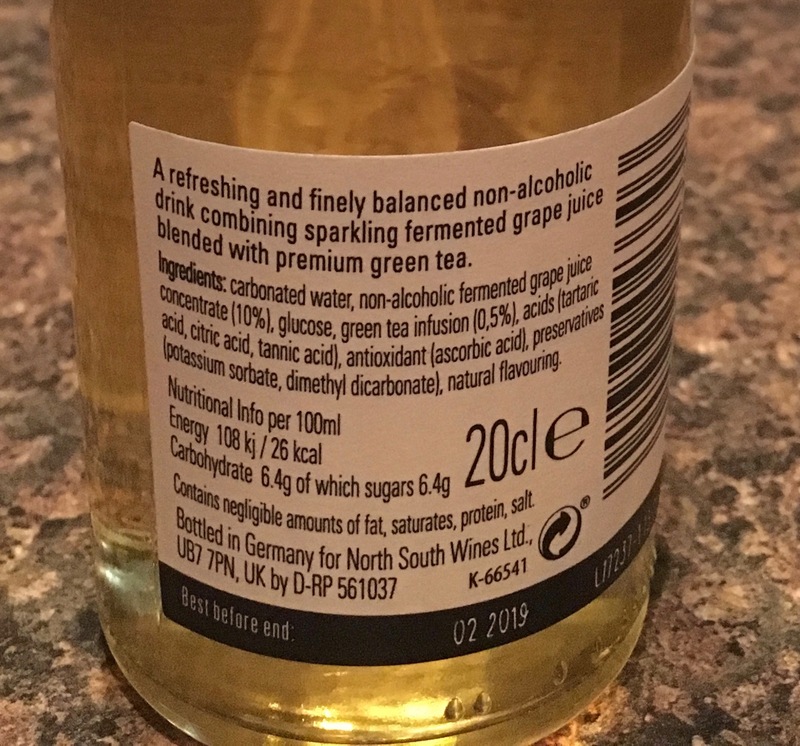 Certainly more grape than floral in aroma, at 26 calories and only 6.4g of sugar per 100ml, there is quite a lot of acid in the flavour of The Bees Knees. In fact, although not so vegan friendly; a little honey might have softened the face twisting acid bitterness that came with the first mouthful. I checked the date on the side of the bottle, just to make sure it hadn't gone passed its best. I couldn't tell if there was any green tea in the flavour, as I was too busy trying to coax my tastebuds back off the ceiling. If you like a (seriously) bitter non-alcoholic wine with your white meat, then this maybe for you, but not for me, I'm afraid!